Remove goat cheese from wrapper and cut into 8-10 discs. Set aside. Heat a small pan to medium heat and melt your butter. Once butter starts to bubble, add your pecans, brown sugar, and a pinch of salt. Using salted butter? Skip the salt or season to taste. Cook for 5 minutes, stirring often to prevent sugar from burning, and pour over a large sheet of parchment paper in a thin layer. Allow to cool for several minutes until the candy coating hardens. Fold the parchment paper in half, trapping the cooled pecans, and crush with hard object of choice (anything from a kitchen mallet to a wine bottle works!) and then roughly chop with a knife until minced. Finely chop cranberries and add to the pecans. Combine pecans, cranberries, and parsley on a plate or cutting board. Mix well. 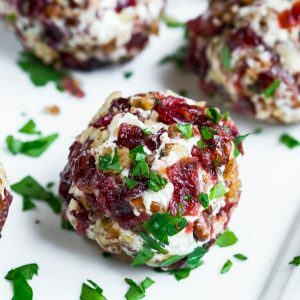 Take a goat cheese disc and press into the pecan coating on each side, then roll into a ball. Coat again as needed by rolling the completed ball in the mixture once more and transferring to a cheese board or appetizer plate. Repeat for each disc until you have a party-perfect plate of goat cheese balls. Dive in with your choice of crackers/fruit/veggies.